Glenn Farkas (second from left), the Republican challenger for Illinois' 9th District state senate seat, speaks at a debate-like forum hosted by the Central Street Neighbors Association on Thursday. Evanston Mayor Elizabeth Tisdahl (left) represented Farkas’s opponent, state Sen. Daniel Biss (D) at the event. The Central Street Neighbors Association hosted a forum Thursday night for several Illinois House and state senate candidates in an Evanston middle school. Nearly 50 people met at Haven Middle School for the forum featuring candidates vying to represent the districts that contain Evanston. Both the Democratic and Republican candidates for the 17th and 18th Illinois House districts attended the debate. The Republican candidate for the 9th Illinois Senate District also attended, and Evanston Mayor Elizabeth Tisdahl spoke on behalf of Democratic candidate Daniel Biss, who was unable to attend the event. CSNA president Mark Sloane said the association hosted the event to give candidates an opportunity to speak to Evanstonians directly and get their opinions out in the open. In the debate’s opening statements, some candidates focused on their personal lives and past accomplishments, while others discussed their hopes for the future. Regardless of their introduction, all the candidates said they had concerns about the economic state of Illinois. 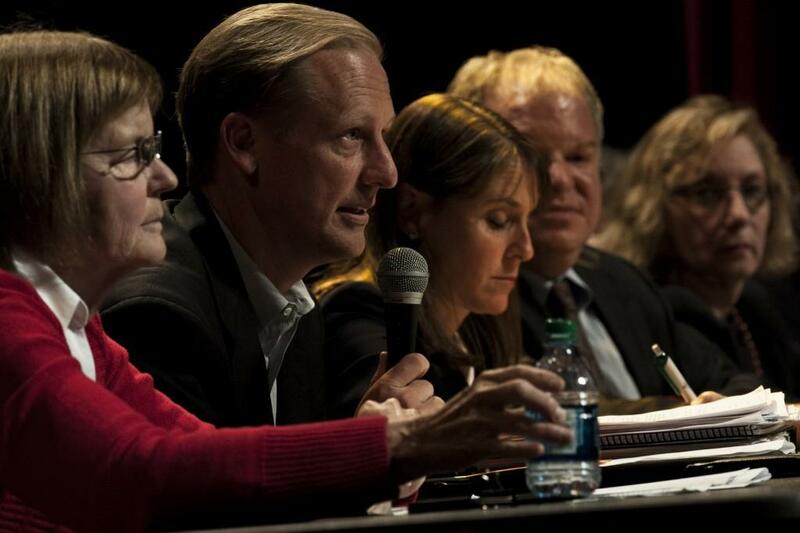 State Rep. Robyn Gabel (D-Evanston) said candidates must develop adequate solutions for the state’s economic problems. “This election is about leadership in times of crisis,” Gabel said. The candidates responded to questions on a range of topics, from local issues involving gun control to broader topics such as the U.S. Constitution. However, the main concerns that arose throughout the Thursday night debate concerned spending on pension plans, Medicaid and education. Republican candidates Kyle Frank and Glenn Farkas mentioned pension and Medicaid spending in nearly all of their arguments. On the other hand, Democratic candidates focused on gun control, women’s rights and rights for the disabled. Democrats also brought up local concerns, such as how state funding cuts affected Evanston. Tisdahl used information provided by Biss before the forum to talk about future plans for Evanston. She spoke about her support for Biss and why she believed he has been a strong leader. The candidates talked less about the issues as the debate heated up toward the end. Republican candidates continued to ask if the Democratic incumbents would vote for Michael Madigan, speaker of the Illinois House of Representatives. Farkas, who is running against Biss for the 9th district state senate seat, said both Madigan and all Democratic incumbents need to be voted out. Eric Lieberman, the Republican candidate for the 18th district House seat, responded by asking Gabel if Madigan had some kind of power that was preventing her to vote against the speaker. He later responded to Gabel’s statement regarding his lack of leadership positions in government. “ I haven’t held a position like you, but I wouldn’t perform it like you either,” Lieberman said.